Tony Klarich “Tip Drop” on a Vertical Air. 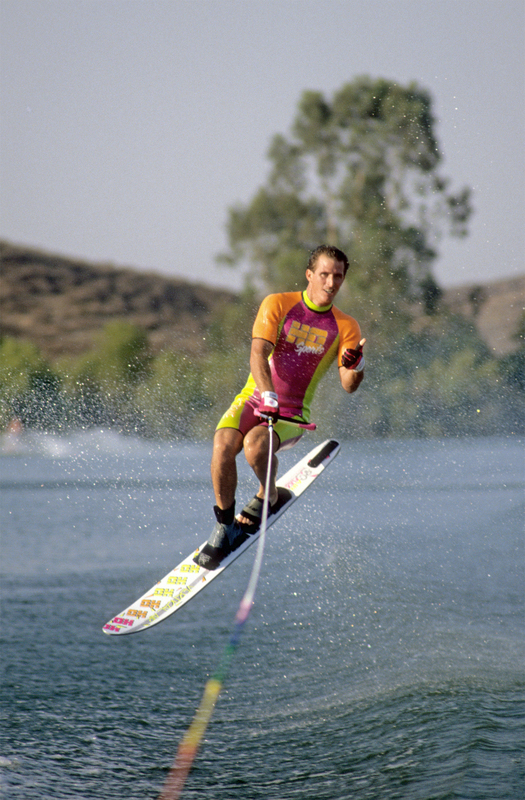 Hot dog water skiing reached its peak of popularity in the late 1980s. Kneeboarding was the biggest thing on water, and it opened the door to mainstream flips and spins behind the boat. The skiboard (led by the foam filled Skurfer) was still considered mostly a toy, and the buoyancy made it tough for most people to get up on. For those who wanted the thrill of kneeboarding, but didn’t want to kneel down, many tried hot dog slalom. Hot dogging became so popular that a ski designed specifically for the ski discipline was produced by HO Sports. It was designed by Mike Mack who took the HO Magnum (a 72″ ski) and cut it down for easier maneuverability. The result was the 63″ Vertical Air, and it was considerably wider than a regular slalom ski. The increased surface area and shorter swing weight allowed for slower skiing speeds and easier tricks. Other manufacturers jumped onboard with a ski of their own like Connelly’s “F44”, and the Jobe “Radical”. The popularity of hot dogging was short lived as HO introduced the Hyperlite in 1991. It was the world first compression molded wakeboard, and it literally redefined the sport. Hot dogging was quick to take a back seat to wakeboarding. The ride was easier to get up on, required even slower speeds, and drew on a crossover boarding culture (surf, skate, snow) that dominated the entire industry for years to come.